Unfancy is on the Lively Show! COOL STUFF. My friend Caroline of Unfancy is on The Lively show this week. Jess' podcast brings "a little intention to your everyday." Week after week I'm filled with positive energy after listening to her array of interesting guests. Designers, meditators (among many other things), startup mavens, bloggers turned small business owners and more. I'm thankful to be pals with both of these ladies, so it delights me to see them team up this week. Give it a listen Caroline gets real fast. I really appreciate her honesty when it comes to body image and consumerism. 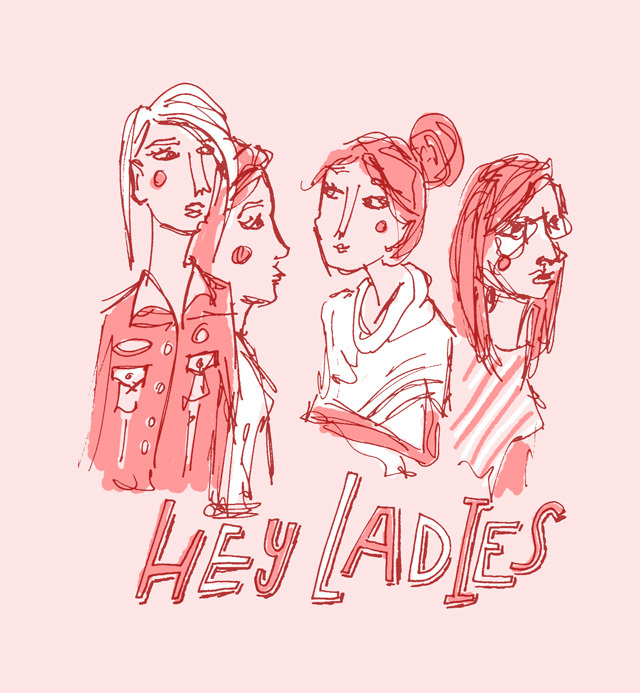 It's a great listen.Check it out, gal pals. You will also learn more about her capsule wardrobe that is taking the interweb by storm! Happy Thursday! I hope your day is off to a good start. 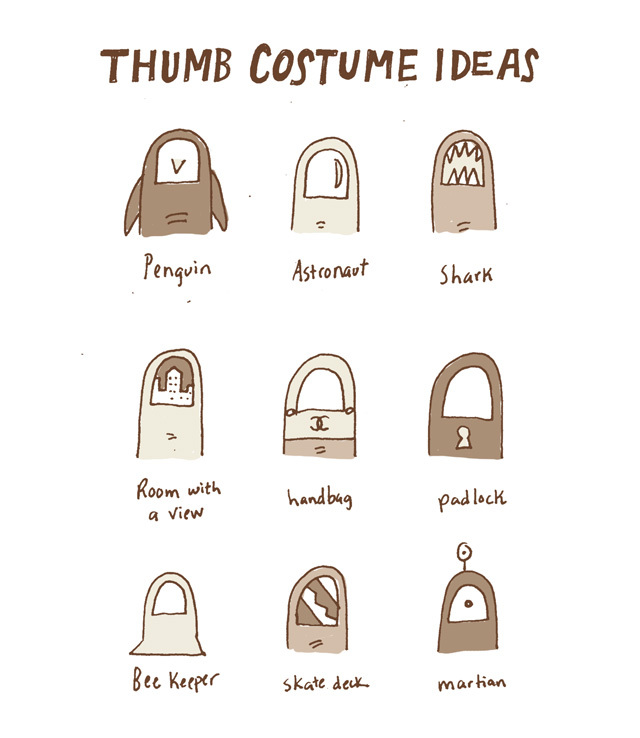 Mine is, because I got my drawings on. Now for this picture. I'm adding more flowcharts to my shop, and this pup has been on my mind. I think I need to look at it every. single. day. A few questions. If you actually read it, does it make sense? Do you have any critiques, spelling errors, etc.? Would you like to see it in color? What color? Do you think it needs to have watercolor script like the other one? This is only a first draft (I'm mostly talking about the header type). I'm excited to roll them out! Do you have ideas for other prints or flowcharts? 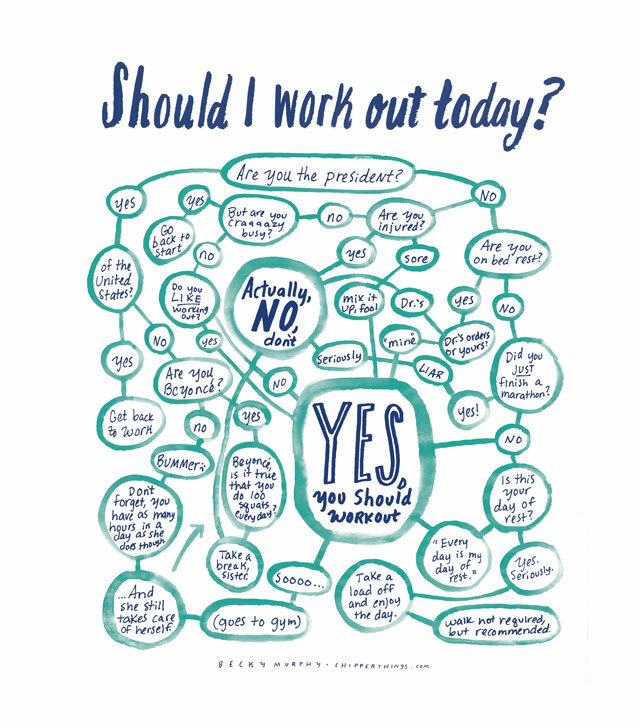 tags: daily drawings, etsy print, flowchart print, should i workout today? Have you read The One Thing? It's a great business book with a simple premise: focus on one thing. One thing that will make everything else easier or make the things you don't want to do go away. It's figuring out which domino needs to fall first in order to set yourself up for success. When I start my day by drawing, I gain a small victory for myself. It's fun and I feel good. The drawing doesn't have to be a portfolio piece, it just has to happen. My dad sent me this podcast interview with one of the authors, Jay Papasan. If you're not sure about diving into the book just yet, give this a listen. I listened to it twice in a row. It's so simple. Now let's go do the thing. Do your friends bring out your sillies? Do you bring it out in them? I say we put on our white spandex and go embarrass ourselves this weekend. Lip dub a music video. Build a fort. Get a neck tattoo. Whatever! Just make it fun and hopefully memorable. These are precious days and we can't waste all of them on classy grown up activities. "Restore International’s goal is to try to change a few lives for the better. We fight for freedom and human rights, work to improve educational opportunities, and try to be helpful to those in need of a voice and a friend...In 2006 we began working in Uganda in human rights and education." 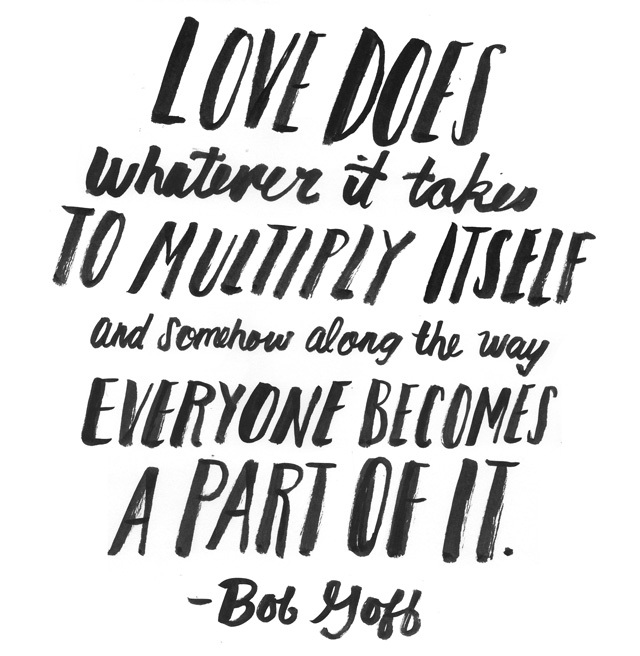 This awesome organization was founded by Bob Goff, and if you don't know who Bob Goff is, I highly recommend you check out his book, Love Does. It's one of the best books I've read in the last year and has fueled my fire for whimsy and loving people the way Jesus loves me. Restore International is changing lives in Uganda and India. As in, children aren't being trafficked and they're now getting an education directly because of this organization. My friend Jenné "Cool Pants" Blackburn is a warrior woman and I'm so excited about her upcoming journey. She's joining the Bob and gang for the Love Does Tour (bike ride from Monterey to San Diego). They're on a mission to raise $100,000 to help Uganda's Restore International by providing "scholarships, text-books, uniforms, medical care and classrooms for future leaders of Africa." Any donation goes a long way. If you feel so called, click here to donate and select Jenné as your rider! You don't have to give to Jenné's fund, but if you do, she'll send you one of these prints I lettered for her. She watercolored the backgrounds. Have an awesome Friday, y'all! P.S. If you missed my last "Pay what you want lettering sale", sign up for my newsletter to get first dibs on the next one. Spots are limited, so it's best to be the first to hear! Should I use this waterproof mascara? When I was in Florida/Alabama last week, Greg's sister, Jamie, requested a waterproof mascara flowchart. It's every girl's summer conundrum, really. Do you prefer a coat of wax instead of constant sob face? Or do you wear nothing at all? What if there's an eyelash volume contest and the winner gets free frozen pizza for the remainder of 2014? Is it worth not competing because you want to avoid some pesky chemicals neighboring your eyeballs? I solute you, Summer Girl, for not taking this decision lightly. *Please forgive the quality of this iPhone picture for being "almost too good looking," as Natalie Portman would say. My J is on Typefight right now. Vote up for your favorite J. It only takes two seconds. Unless you get hooked and start voting for all of the letters, which I recommend. **What is Typefight, you ask? It's a fun competition between designers/letterers. You're given a letter, then you design it, then it goes into the ring for a few days, then BAM the people decide who gets the glory. The Chipper Things Print Shop has arrived. It's an Etsy store and it's modest. I'm calling Monday the official launch, but let's be honest, she's ready for business. I've wanted to bite the selling my prints bullet for over a year, but little things stopped me. Too busy. Do I do Etsy or another platform? How do I ship them? Where do I get cardboard backings and plastic sleeves? Where do I print them? Do I have to print huge expensive orders? What if nobody buys them and I look like a fool? Everybody sells prints, what makes me think I'm so special? Will it be worth my time? I want to give back, but to which organization do I donate and how much? These are all small things, but added up, they prevented me from making a simple step forward. I already had the art; I just didn't know how to execute. Eventually I figured it out one by one. I paid my sister to set up the shop. I went with Etsy because it was the cheapest. I asked people on Twitter how they package their prints, and I was told to try Clear Bags, which I did and is great. I print them at a printer just five minutes away and they are not expensive (and I don't have to print huge orders). I stopped caring if they really sold (then I sold 25+ on Instagram). I am going to give back to PelotonU (provides mentors and scholarships to hard-working student who would otherwise not be able to attend college). I don't have to know if I'm going to donate 5 or 10% before I start selling. I don't have to marry this cause. I just need to start somewhere. If you have a hankering to order, I suggest you do it on Monday, where you will receive an extra surprise print from the shop with your order. Perfect for another spot on your wall. OR, keep it in the packaging and give it to a friend as a gift. Thanks for your support! I'm excited to have a platform where I can sell more art and test new ideas in the future. *Chipper Things prints are also available at Mockingbird Domestics in Austin. I'm still very excited about this. If you follow me on Instagram, you may have already seen this. For those of you who don't, do. Inspired by @caroline_joy's pay-what-you-want mentoring program, tomorrow I'm giving my own version a shot. If you want a custom 8.5x11" lettered print, send me however much you want to pay over PayPal (beckycmurphy@gmail.com). In the message, include the words or phrase you want lettered. ALSO make sure your shipping address is up to date. The rules: type only, 1-2 colors, pick 1 of the 3 types of type in picture above (1-drawn // 2-watercolor, non-script // 3-script). Woo hoo! This is going to be fun. Looking forward to the goodies that await me. I'll post some of the goods I came up with tomorrow or next week. Thanks for the support, everybody! Hey friends! I'm really excited to start selling prints. 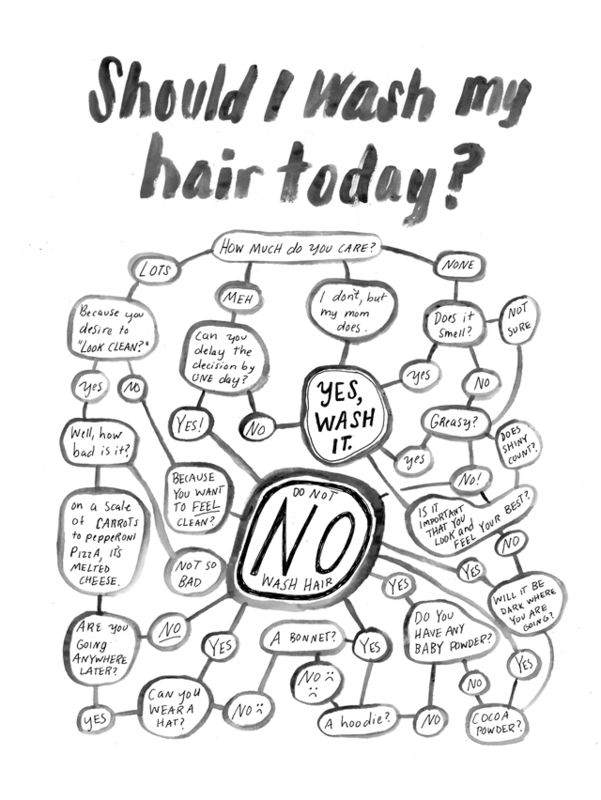 It's something I've been wanting to do for a long while now, and when a friend asked for a copy of my "Should I wash my hair today?" 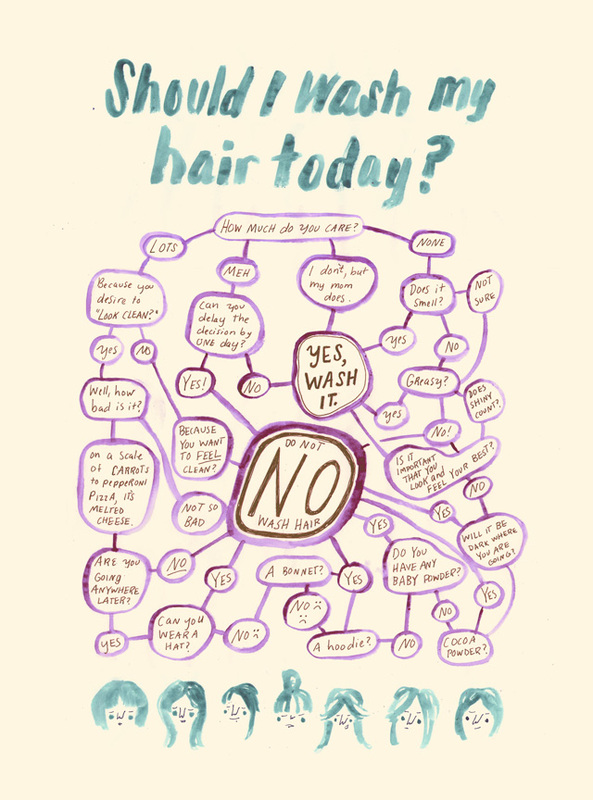 flowchart, that was just the nudge that I needed. I will have six to choose from (each pictured in above gif). You may be familiar with a few. Perhaps you remember this or this? I'll be selling them throughout the day on Friday on Instagram through an awesome new app called #imightneedthis. 1. Sign in with #imightneed this. It's really easy. You'll just sign in and enter your bank/debit info. 2. Follow me on Instagram (@beckycmurphy). 3. When you see the item for sale in your feed, just hashtag #sold and you, my friend, are the proud owner of a new print. Stay tuned for this Insta blitzkreig on Friday! Prints are 8.5x11" and $18 each. Are you or your friends running the Austin Marathon tomorrow? I hope you find this scavenger hunt helpful during your quick jaunt around town. I'll be there too—but on the sidelines. We'll be drinking mimosas and waving signs of encouragement with pals, for pals. I posted this Instagram in December and it proved to be popular with the ladies. I decided to take it a step further and make it legible for the blog. I made this doodad into my new Twitter background. I like it! I've been having fun with pattern play, as you can see below. I'd like to eventually sell goods with said patterns (fear not, there are more!) I will keep you posted. Where do you recommend printing on fabric, wallpaper, etc.? I've heard good things about Spoonflower. Do you know of anywhere else? Do recommend any certain product? In case you were wondering, Wordpress has already awarded me the "Congratulations, This Is The Vaguest Request For Printing Advice Post of February of 2014", so I at least have that. I try to keep my sketchbook on hand at all times. I'm always learning and always drawing. Little purses may suit me proportionally, but if they can't hold my sketchbook, they can find the door out. You may know from a recent Instagram that Bekz and I built a little something that looks like this. Today, I present you with a case for blanket forts and why every young lady needs one. 1. Hosting becomes easy. Nobody expects you to make dinner or even provide the wine. When folks are in the fort, they just want popcorn, M&Ms and/or cookies.They're too busy being surprised that you actually built the fort that you told them would be there upon arrival. 2. Slumber parties feel more natural than taking out your contacts after a dust storm after sleeping in them after they were already old in the first place. The giggles flow like milk and honey. The conversation turns from preferred oils for roasting vegetables to James Van Der Beek's hair. Jeans are exchanged for jammies and phones can get the hellouta town. 3. May as well call it Fort Whimsy. In 10 years, which of the following scenarios are you most likely to remember from your early adult days with your roommate: A) talking about what you ate B) spending hours in front of the mirror getting ready for another weekend out C) spending good, quality time cleaning together every Saturday morning D) building a badass blanket fort that stays up one week too long and 51 weeks too short. There's no wrong answer; unless you picked A, B or C.
4. Cheaper than water. These days it seems like the only way to do something fun is to spend a few bucks on movies, bars, restaurants and concerts. Sure, we could go on hikes, make music videos or look at Beyonce books at the library, but we usually don't think of it. In A Million Miles In A Thousand Years, Donald Miller talks about how in movies they don't do small talk in small places. Folks aren't sitting in coffee shops—they're kayaking or running from volcanos. Gilmore Girls is the exception, not the rule. 5. It's easy as pie (charts). It only took us one hour to build this beaut. We didn't even have to plan or buy nothin! I bet you already have what it takes.